With today’s technological and medical advancements, it’s not a surprise to many that aging lines and wrinkles on your face can now be removed with non­surgical procedures. Here at Summerskye MD, we offer customized Botox treatments for individual patients who are having issues with their skin. Dr. Cheema provides her patients with customized treatments based on your facial anatomy, depth of wrinkles and skin tone for guaranteed results. Loss of bone structure and underlying tissue support makes a person look older. Another issue that contributes to the appearance of aging is the quality of the skin itself. Lines and wrinkles result from a number of causes including the natural ageing process, sun damage, smoking, contraction of facial muscles, chronic dehydration, and loss of volume of the skin. 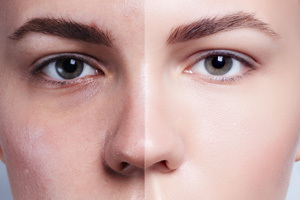 Line and wrinkle treatments are commonly seen in the upper part of the face, which can be treated with simple Botox treatments that can combat both fine lines and also deep wrinkles. These treatments have been used as specialist cosmetic treatments since the late 1980's, revolutionising the cosmetic industry with their remarkable results, combined with very few risks and no recovery time. Wrinkle relaxing injections have been used to treat millions of patients worldwide and has become the world's most popular non­surgical treatment. The reason for the growing popularity of these treatments is because of some adverse effects of surgical procedures. When compared with all other surgeries, these cosmetic surgical treatments require a lengthy recovery period which can be one or two weeks. Patients might need to keep away from work due to swelling and bruising. Even after all that has been done, the results from these treatments are not always permanent. The non­surgical, cosmetic injections provided by Dr. Cheema and her team allow patients to avoid many of these disadvantages associated with surgical procedures and still see amazing results. Over the years, our facial muscles often begin to subconsciously tighten and create cosmetic issues such as “worry lines” and forehead creases. Botox injections allow those muscles to slowly relax and reduce the visibility of the wrinkles. Creases that have been caused by sun damage or gravity will not respond well to Botox injections. Patients with those types of creases might benefit from another cosmetic treatment. How do wrinkles and fine lines make a person look older and make them lose their confidence? The eyes are surrounded by a frame that helps shape our face. A loss of volume to the temples and tear trough areas, combined with fine lines around the eyes make a person look older and make them lose their confidence. This leads many to seek out treatment options. Volume and support are easily restored with cosmetic dermal fillers. Using Botox around the eyes is an excellent option in softening, if not resolving, the lines that have developed. At Summerskye MD, Dr. Cheema and her team of expert and dedicated professionals has been providing patients with customized treatments to help reduce the look of fine lines and wrinkles using an advanced, non­surgical approach with minimal to no side effects. What Should I Expect With This Type of Botox Treatment? On the day of the treatment, the patient’s face will be thoroughly cleaned, and markings will be made on the injection sites. A topical anesthetic is then used to numb the area, and the injections are carried out. Unlike dermal fillers that are injected directly into the wrinkles, Botox is injected into the muscles that control the facial skin. The majority of patients will experience absolutely no unwanted side effects, but some may notice minor redness near the injection sites. In the days following the treatment, their facial muscles will begin to relax, and their lines will disappear. These results will often last for three months or longer. Patients can then schedule additional injections to maintain their smooth and toned skin.